Tin oxide films (SnO2) have been studied with a focus on application to sensors, transparent electrodes in displays, heat mirrors and transparent conducting oxide (TCO) coatings for solar cells [1-5]. SnO2 films have been prepared by several deposition techniques, such as pulse laser deposition (PLD), photo-MOCVD, reactive evaporation, spray paralysis, sol-gel process, and dc/rf sputtering [6-8]. PLD is the plasma produced by the interaction of high-energy laser pulses with matter in any state of aggregation [9,10]. Laser induced plasmas of metals and alloys are of great interest since they have different attractive and important applications, e.g. material processing, thin film deposition, the synthesis of nanoparticles, the elemental analysis of multi component materials, precision machining, and laser induced breakdown spectroscopy (LIBS), surgery, and laser micro-probe mass spectroscopy [11-13]. The PLD experiment was performed at room temperature and the as-grown samples were not annealed after deposition. PLD setup scheme has been shown in Figure 1. The crystalline structure was examined using X-ray diffraction (XRD). Optical properties (UV/VIS absorption spectrum) of the SnO2 films were performed using. (UV-Visible spectrometer). The laser pulse energy was varied from (400-800) mJ with increment. 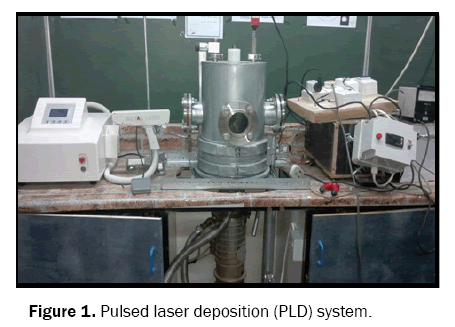 Figure 1: Pulsed laser deposition (PLD) system. Figure 2a: XRD of SnO2 thin film with Number of shoot=400 and different energies. Figure 2b: XRD of SnO2 thin film with Number of shoot=600 and different energies. Figure 2c: XRD of SnO2 thin film with Number of shoot=800 and different energies. Where λ is the wavelength of X-ray used (1.54 A), βis the full width half maximum (FWHM) of the peak and θ is the glancing angle. The calculated crystalline size (D) of Tin oxide is tabulated in Table 1. The FWHM and the grain size of the samples are shown in Table 1. Table 1: Thin film and different energies. The optical properties of SnO2 have been determined by using spectrophotometer in the wavelength range (200-1100) nm. 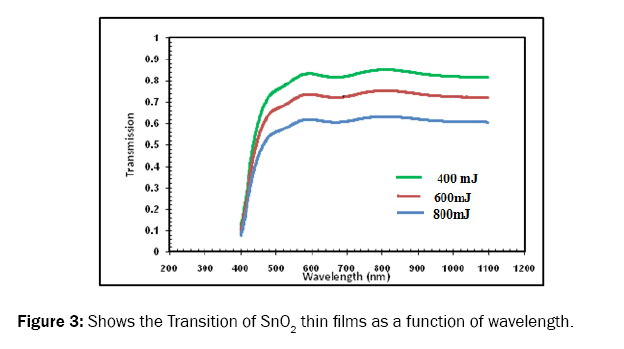 SnO2 thin films were successfully deposited onto glass substrate and the films were very transparent. Transmittance spectra recorded for SnO2 films as a function of wavelength range (200-1100 nm) at different energies 400, 600, and 800 mJ shown in Figure 3. Figure 3: Shows the Transition of SnO2 thin films as a function of wavelength. This Figure 4 show that the transmittance decreases with increasing of energies due to increasing of thicknesses. Figure 4: Shows the Refractive index of SnO2 thin films as a function of wavelength. Figure 5: Shows the Reflective of SnO2 thin films as a function of wavelength. The typical plots of (αhν)2 versus hν for SnO2 thin films with (400, 600, and 800) mJ energies deposited on glass substrate is shown in Figure 6. It is observed that increase in energies of laser lead to increase in optical band gap from 2.756 eV to 2.9 eV. This may be associated with variation the crystal structure with laser energies. Figure 6: Shows the direct electronic transition for nanostructure SnO2 thin films. In this work we have reported the influence of energies of laser in the structural and optical characteristics of SnO2 thin films. 1. The deposition films are having the polycrystalline structure of Tin oxide with cubic structure. 3. The optical properties was proportional with laser energies. 4. The band gap increase with increasing of laser energies. Stambolova K, et al. Lanthanum doped SnO2 and ZnO thin films sensitive to ethanol and humidity. Mater Ce Phys. 2000;63:104. Chen M, et al. ZAO: an attractive potential substitute for ITO in flat display panels. Mater. Sci. Eng. B 2001;85:212. Rye YR, et al. Synthesis of p-type ZnO films. Journal of Crystal Growth. 2000;216:330. Martinez MA, et al. Deposition of transparent and conductive Al-doped ZnO thin films for photovoltaic solar cells. Solar Energy Materials and Solar Cells. 1997;45:75. Reddy KTR, et al. Effect of gallium incorporation on the physical properties of ZnO films grown by spray pyrolysis. J Cryst Growth. 2000;210:516. Song J, et al. Electrical and optical properties of ZnO thin films prepared by the pyrosol method. J Korean Phys Soc. 1996;29:219. Lee JH, et al. Electrical and optical properties of ZnO transparent conducting films by the sol-gel method. J Cryst Growth. 2003;247:119. Smith HM and Turner AF. Vacuum deposited thin films using a ruby laser. Appl Opt. 1965;4:147. Dijkkamp D, et al. Preparation of Y‐Ba‐Cu oxide superconductor thin films using pulsed laser evaporation from high Tc bulk material. Appl Phys Lett. 1987;51:619. Chrisey DB and Hubler GK. Pulsed laser deposition of thin films. Wiley, New York, 1994. Scarfone C, et al. Pulsed Laser Deposition (PLD) -- A Versatile Thin Film Technique. Mat Res Soc Symp Proc. 1991;191:183. Fahler S, et al. Origin and avoidance of droplets during laser ablation of metals. Appl Surf Sci. 1997;109:433. Burukhin DS, et al. Hydrothermal Synthesis of Nanocrystalline SnO2 for Gas Sensors. Inorganic Materials. 2003;39:1158-1162.